Make new friends and influence strangers with new boons that develop your character in exciting and sinister ways. 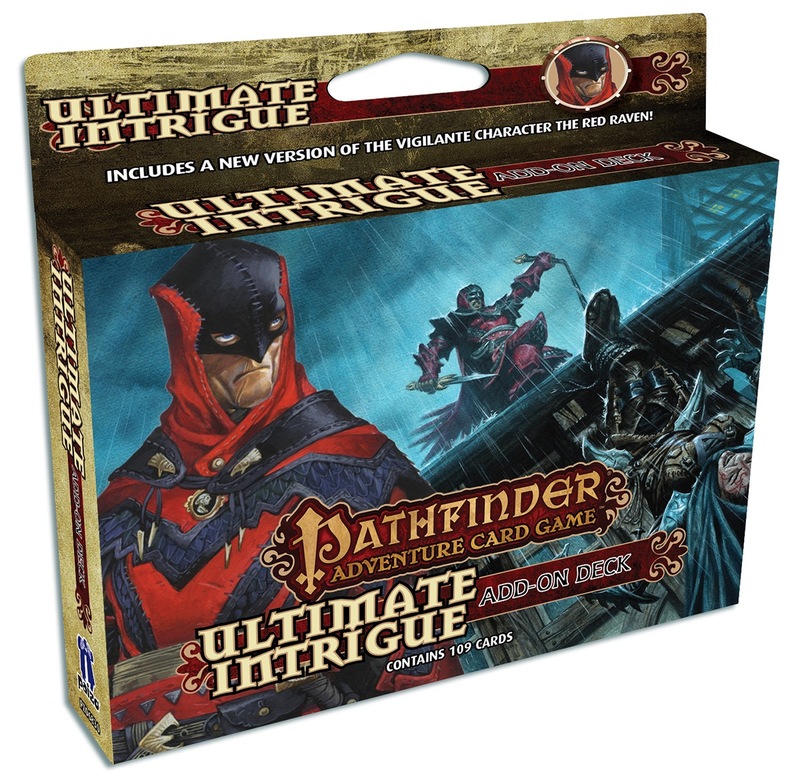 Brimming with poisons, weapons, and underworld contacts, the Ultimate Intrigue Add-On Deck can be used with any Pathfinder Adventure Card Game character or Adventure Path. Or you can play with the character included in this 109-card box: Aric the Red Raven, the iconic vigilante. 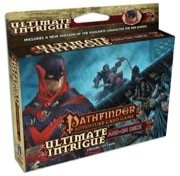 Transform your identity with the Ultimate Intrigue Add-On Deck! Note: This product is part of the Pathfinder Adventure Card Game Subscription. Announced for May 2018! Image and description are not final and may vary before release! Interesting...and rather unusual to include only the iconic, correct? Anything in here a bard might care to use? This blog post talks about the four Ultimate decks, why there is only 1 character in each, and how they are expected to interact with the old class decks. Ah, thank you! I missed that. Comes from being a teacher and away from computers a lot over the summer. I will have to check these out. Just got mine in the mail and while I'm pleased with the cards and the variety, I'm quite disappointed to find there are not, in fact, any new poisons. You should update your description since it's not true (or was it the Ultimate Intrigue at work?!). There are no Poison items, but there are three other cards that add the Poison trait to checks (the weapon Serpent's Fang, the ally Isiem, and the Blessing of Anubis). There are also things that reduce Poison damage (the armors Patrician's Armor and Ophidian Armor, and the item Karyukai Tea Set), buff Poison checks (Karyukai Tea Set again), and let you recharge discarded Poison items (Serpent's Fang again). You are right poison is at play more broadly, but I had a more specific expectation. I thought about why that was and here's what I can say. We received several poison items in the Rogue deck, and the description for that says "packed with new poisons." Precedent, similar wording and a complementary theme had my hopes up to see more poison items in Ultimate Intrigue. I also collected most of my PACG all at once (after finding the game a few months ago) so my sense of "what came with what" is still fresh. In any case, I still quite like the pack! So what is good in here for a bard?